The Official Mort Künstler Blog: Happy Birthday, Mort! A very happy birthday to Mort, my boss, the man who gives all of us a run for our money. Most days, we’re lucky if we can keep up with him. His mind goes a mile a minute, and usually he moves and talks just about that fast, too! It’s hard to believe he’s any older, quite frankly, as he’s got the enthusiasm of a little kid. The incredible number of paintings he has done might be the best clue to his age, if they weren’t roughly the amount it would take me three lifetimes to complete. 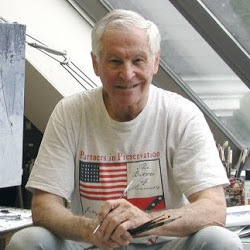 So with another year turning in the life of Mort Künstler, we sincerely thank you fans for your enthusiasm and support. He has much to celebrate, and in characteristic fashion, he’ll do it in a flurry of action, working hard. He’s locking himself away all day to paint the snow scene! Happy Birthday as well from someone who appreciates every day starting with your website and allowing me to honor my Great Grandfather and his and his brothers sacrifices in that terrible war. You keep their spirit alive. May you have many more days of success and happiness. Lee Hillman-Hazard, Ky.